Diane Wing, M.A., is a multi-published author of dark fantasy fiction, cozy mysteries, and enlightening non-fiction. Diane is introducing a new mystery series called Chrissy’s Mysteries in 2018. Diane is an avid reader, bibliophile, lover of trees and animals, and a lifelong learner. She and her husband are pet parents to a sweet little Shih Tzu named Chrissy. Autumn Clarke survived the car crash that killed her parents. 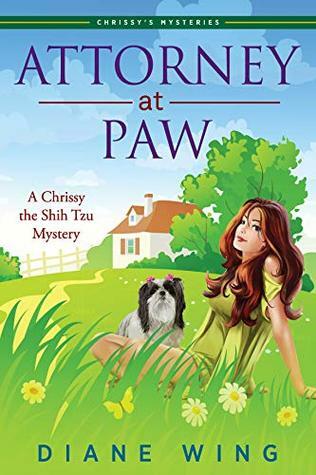 To help her cope with PTSD she adopts Chrissy, a beautiful Shih Tzu with a remarkable secret. Chrissy is also the only witness to the mysterious death of her pet parent, a prominent attorney. Autumn vows to find the truth behind his death. With the help of Chrissy, the neighbors, and an attractive detective the list of local suspects grows. Autumn puts herself at risk to unravel the life and death of Chrissy’s pet parent while trying to heal Chrissy’s trauma and overcome her own devastating emotional wounds. Can Autumn open to love and find healing in the midst of a dangerous murder investigation? Giveaway ends October 24, 2018.